As you'll probably remember, we love a good monstery book here on ReadItDaddy particularly when there's a grand rumpus involved. 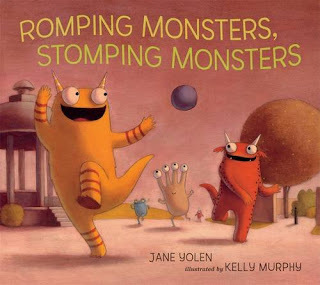 In "Romping Monsters, Stomping Monsters" there's plenty of rumpus indeed as we bounce along with brilliant rhyming text to scenes of little monsters doing what they (and indeed our own little monsters) do best! Jane Yolen's book is brilliant to use as a way of indulging in a bit of romping, stomping and indeed jumping, splashing or sliding. It's a nice fit for this week's #ReadItMD13 theme of movement (and monstery dancing too!). The true acid test of any monster book are of course those monsters themselves, and Kelly Murphy has come up with some truly fabulous creations as we follow each page spread and scene as it unfolds. A romp, a stomp, a monstery whomp! Charlotte's best bit: A monster-eyed lolly to be licked in the park! Daddy's Favourite bit: Monster kids behaving badly, but saying sorry afterwards, aw bless 'em!